If it’s not positive, I don’t post it! I get it. I really do. There are too many polarizing issues going on in the world that evoke strong emotions, it’s hard not to share, comment, or respond to the madness. The problem, at least as I see it, is that as equally passionate as you are, regarding whatever it is that is going on in the world, there’s someone (or a lot of someones) that are just as vocal on the other side of the fence. True? The rational, logical, sane post in your eyes (and often mine too) is met with strong emotions that only evoke MORE emotions! Unfortunately, I’ve found that this kind of emotion often leads to a negative energy vortex that I want to avoid getting sucked into at all cost! Do as you please, BUT please evaluate how what you do is working, or not, for you. 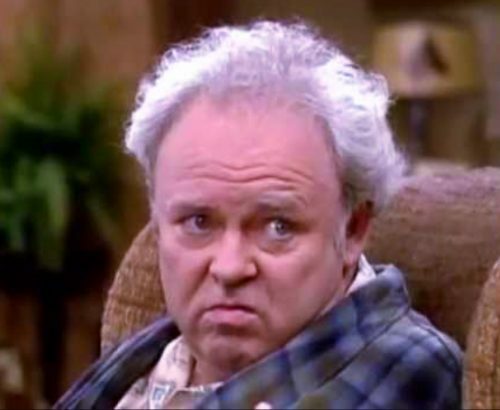 Archie Bunker would certainly have a heart attack everyday with the craziness of today’s society! Don’t give yourself or others a heart attack by becoming an Archie Bunker.